Every June, the biggest event in the poker world kicks off at the Rio in Las Vegas. In fact, not only is the World Series of Poker the largest poker tournament in the world, it's the largest tournament of any kind in the world. It's bigger than anything on the PGA circuit, the professional tennis circuit, any circuit. In 2013, the WSOP edged very close to $200 million in total prize money. This number is even more staggering when compared to the paltry $22 million in total prize money in 2003, the last year the WSOP was owned and operated by Binion's Horseshoe. With total prize money up by almost 900%, how outrageous is my claim that Caesars (then Harrah's) has screwed up the WSOP? Looking at the WSOP purely from a numbers perspective, the WSOP has been a massive success for Caesars. But don't let those numbers fool you into thinking that Caesars stewardship of the WSOP since 2004 has been all, or even mostly, good for players. A substantial part of the massive growth of the WSOP would have happened regardless of management of the event - you only need to look back to 2005's Celebrity Poker Showdown to realize that anything containing the word "poker" succeeded during the heart of the poker boom. Caesars didn't create the poker boom. They were, I admit, smart enough to recognize its potential, and did use their considerable market heft to bring it more into the mainstream. So what exactly did they do wrong? Following is a far-from-exhaustive list of the mistakes that Caesars has made in managing the WSOP. There are many more; I chose these because they are the easiest to see if you're a first-time visitor to the event, and they're the major irritants that I hear about most from players. These are listed in no particular order. 1. Prices. The Rio has made it very clear to poker players that they are there to squeeze every possible dollar out of the player. You'll see this the first time you buy a $1.50 banana [SteveB notes that several venues charge $2.50] or a $2.50 bag of M&Ms. I don't begrudge the Rio for charging exorbitant prices for swag - that's what swag is for. Be prepared to pay $30 for a t-shirt and $25 for a hat. If you go to the Bellagio gift shop, you'll pay $25 for a hat, too. But many poker players are at the Rio for extended periods during the summer, and at $10+ for a hot dog, their outrageous prices add up. I'm a little surprised that there hasn't been a player revolt over this. The first year the WSOP was held at the Rio (2005, except for the final table), they tried to charge players for drinks, but that was short-lived as a result of massive backlash from players. 2. Rake. This could be combined with #1. The Rio charges 10% rake up to $5 (vs. the $4 max in their regular poker room), but that's not the bad part. If there is money put in the pot voluntarily, they rake the pot for the full rake, including uncalled bets. For example, let's say you're playing $2-5. One person limps, then you make it $30. Everyone folds. From the Rio's point of view, there is $42 in the pot, and they rake $4, even though $30 of it is your uncalled bet. So the part of the pot that represents money won by you is $12 (the blinds plus the limper), and the Rio takes 1/3 of it. 3. Marginal staff. I'm going to admit up front that this is a tough one. The WSOP drains every poker resource within 400 miles of Las Vegas, and regardless of any criticisms I may make, pulling off 65 bracelet events, hundreds of side tournaments, satellites, cash games and everything else is a Herculean task. I know, because I've done it on a smaller (but still substantial) scale during five years of the PokerStars Caribbean Adventure. That having been said, Caesars owes it to the poker community, which contributes millions to Caesars during the WSOP, to get this right. For the most part, dealers this year are average, which is a huge leap from prior years. I still saw dozens of dealers who barely understood poker, much less dealing. In a particularly egregious example, I played 5-5 Pot Limit Omaha a few weeks ago with a dealer who came into the box, looked at the game plaque and said, "What's pot limit mean?" We patiently explained, finally telling her that we would just tell her what to do. At the end of her down, she pushed to the top section 10-25-50 PLO game. I suspect she was never heard from again. Floor staff is a much bigger problem. While I have seen a number of floor people that I know this year, the sheer numbers that the WSOP requires creates situations in which inexperienced floor staff make offhand, incorrect decisions that can cost players thousands. One example: a coworker of mine played in Event #1, the Casino Employees Event, and had gone quite deep - when this hand happened, there were about 50 players remaining of the starting field of about 850. He was pretty short-stacked, with about 20 big blinds, and was waiting to pick up a hand. It was folded to him in the hijack, he raised with AKs, everyone folded and the dealer pushed him the pot and took his cards (in that order). The dealer then realized that there was, in fact, an early position limper who hadn't acted and still had cards. The dealer called the floor. The floor's ruling: since the limper was the only player who still had cards, the pot was his. This notwithstanding the fact that (1) my coworker didn't release his hand until the pot was pushed to him, and (2) about half the pot was already in his stack. The floor had the dealer recreate the action from my coworker's chips and then awarded the pot to the limper. Aside from this ruling being completely wrong, the floor should have enough common sense to know that this was wrong even if it complied with the rules (which it didn't). At the very least, he should have consulted with another floorman. We're dealing with large amounts of money here, and we deserve way better than this. I spoke with Jack Effel after this happened and he confirmed that the floor made a mistake here. Related note: I talked to a floorman about a different egregious decision and received a response I can only describe as "tepid." I commented on the fact that floorpeople really should care about these issues, since these are their customers. The floorman's response: "We don't get paid enough to care." 4. Pervasive lack of understanding of poker. Many of the problems at the Rio during the WSOP track back to a simple fact: Caesars doesn't understand poker. Say what you will about Binion's, even in its death throes in 2003-4, but poker was in their DNA. They understood the game and the players, and made decisions accordingly. I have dozens of examples, but this is one that goes right to the heart of the problem. Caesars has, for 10 years, chosen to use the table felt to promote various stuff (The Rio, Caesars Entertainment, Jack Link Beef Jerky, etc.). In principle I have no problem with this - it's valuable real estate on display on hundreds of tables, for tens of thousands to see during the six weeks of the WSOP. But if they're going to do this, they need to remember that this is the playing surface on which decisions worth thousands, hundreds of thousands, even millions will be made. I don't think it's too much to ask that marketing on the felt not interfere with the game. It's been worse in prior years, but this year the Rio decided to add a multi-color, red-white-black "10 Year Anniversary" logo on one end of the table. At some point, someone at Caesars must have realized that they have black chips in play, but decided this was OK anyway. I have seen no less than 20 situations over the past month in which a player at the opposite end of the table was unable to see one or more black chips that were obscured by the logo. This is bad in tournaments, but at least in that case the problem goes away once the $100 chips are out of play. But in cash games, not seeing a $100 cash chip can be a very expensive oversight. 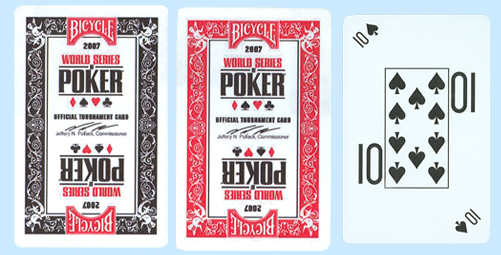 In a similar case of a lack of understanding of poker, in 2007 the Rio introduced the "WSOP Poker Peek" deck. The first time I saw them, I had two reactions: (1) I like that they're using a large index card (I'm getting older) and (2) these cards are ugly and busy. Someone apparently didn't realize that, in this context, with the numbers tilted, players have no way to distinguish a 6 from a 9. Had Caesars put these decks in the hands of just a few poker players, they would have caught this before they produced over 100,000 decks. The final result: they dumped all of these decks and had an emergency shipment of decks shipped from Kem. In 2006, the WSOP created the position of "Commissioner of the WSOP" and appointed Jeffrey Pollack as its first (and last) commissioner. Jeffrey's name and signature are on these cards, but if you look closely, you'll note that his name is spelled "Jeffery." I don't think there was much chance that these cards would have survived because of the 6/9 issue in any case, but with the Commish's name spelled wrong, they were doomed. 5. Break time clusterf***. I may be hypercritical here, but when you have 5,000+ people in a confined space, there are logistical issues that really need care. I don't know that there's a good way to handle tournament breaks during the huge events at the WSOP - if you have an event with 4,000 players, and there's a break after two hours, 3,500 of those players will still be in, and at least half of them will need to pee (more in the Seniors event). But with breaks of only 20 minutes, there is no chance that players can make it to the bathroom and back. And to make the problem worse, no one has coordinated the breaks of the side events (multi-table satellites, deep stack tourneys) with the breaks of the main events, so it's entirely possible that you'll be lined up with far more players than if there were some planning. In every event I played, we had at least one and sometimes as many as four empty seats when we restarted after the break. One possible solution: in large events, have two breaks. Table numbers 100-250 go on break now, 251-400 go on break 20 minutes into the level. 6. Hallway gauntlet. This problem got slightly better towards the end of this year's WSOP, due in part, I suspect, to my friend Nolan Dalla's intervention. Caesars has rented out space in the WSOP hallway to a variety of vendors over the years, and I'm not opposed to the idea; many of them have interesting stuff to sell. But most of the time when I'm walking down that hallway, it's either to get to the bathroom or to get back to an event. The last thing I want is to run a gauntlet that looks more like the Spice Market in Marrakech than a hallway at the WSOP. The first few days of the WSOP this year, vendors at several of the booths employed identical tactics to those that solicitors at airports use: "Excuse me, sir, is this your phone?" You look up, the guy catches your eye and now you're stuck. The other one that I heard no less than ten times during the first few days of the WSOP: "Excuse me, is that a Mophie case?" (It's an extended battery for my phone.) When I said yes the first time, I got the beginning of a pitch about how his extended battery was better. I excused myself. A few hours later, same guy, same pitch. Around the 10th time, I said, "Yes, it's still a Mophie case, just like it was when you asked me at the last break, and the previous one, and yesterday." So given my acknowledgement of the horrifyingly complex logistics of the WSOP, is it fair or reasonable for me to level these kinds of criticism at Caesars? I think the answer is a resounding yes. From tournaments alone this year, the Rio will gross about $12 million in fees. I would guess they snare more than that in rake, although I've never estimated it. Add in food, swag, fees from vendors, ESPN broadcast rights fees and all of the other associated revenue streams, and you have a business that grosses $50 million or more over a six week period, almost all of which comes directly from the pockets of the players. We have a right to demand a high level of service, and Caesars has had more than enough time to get this right.